There is nothing really special about these - new (at least in my area) - found them yesterday at a Dollar General store (4 can pack for $2). Regular "design", with "16oz." 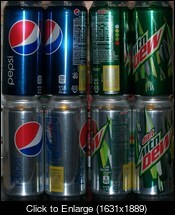 around the top, and a yellow UPC on the cans. Again, nothing really special, but just wanted to share.